I took this picture about half an hour before I witnessed possibly the most amazing thing I’ve ever witnessed on a road bike. It shows the entry to the fabled Arenberg Trench, possibly the most famous collection of cobblestones, in without doubt, in my mind at least, the greatest one day cycle race of them all, Paris-Roubaix. What this photo fails to do however, is give any idea of the severity of the surface. It hides all the lumps and bumps that make this so fearsome. It’s the TV helicopters that give the first indication that the riders are getting closer, buzzing about in the air, sharing this spectacle with millions at home all around the world. The atmosphere changes, as people begin to jostle for position. The stream of cars and motorbikes that proceed the lead group ratchet things up further. 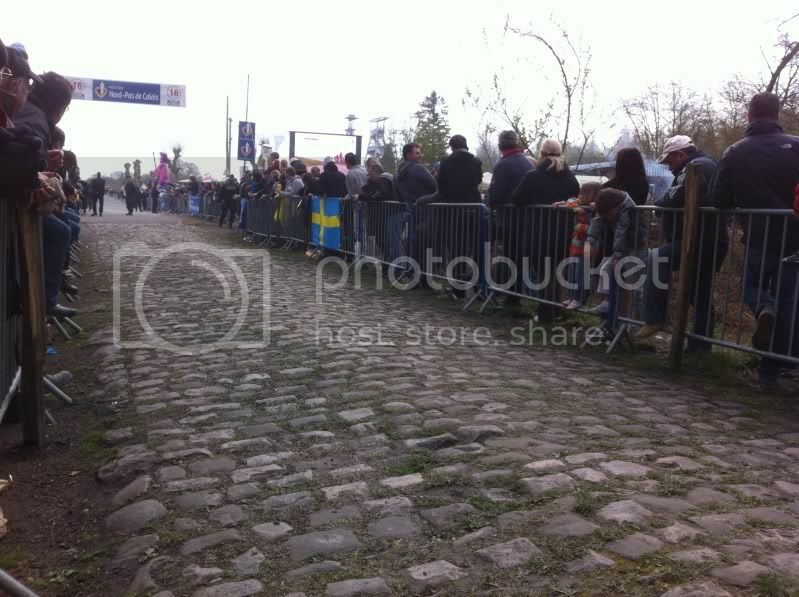 The entry to Arenberg must be simply terrifying for the racers. Downhill, and dead straight, the riders are ‘full gas’ at the entry, doing well over 50km/h. The road narrows as the riders are funneled from the main two lane road into the narrow section of Pavè. In the distance the lead group of a dozen of so riders appear, and in no time they’re here, all trying to get the right line in the final few metres before the cobbles. The speed as they hit the cobbles is quite simply staggering. They must have been doing 55km/h as they pass within inches of the barriers. These are truly brave men. And then they’re gone. The train of team cars pass in the bubble of dust, noise, and organised chaos that follows. Suddenly, brake lights ahead and all the cars stop. One of the Net App riders has gone down, hard. He’s taken other riders with him as he slid across the cobbles into the steel barrier. Ouch. Amazingly the fallen riders are up in no time and the road is cleared to make way for the chasing bunch. Get well soon Grischa Janorschke, who suffered broken bones in the crash. The chasing pack, including all the big favourites are just over two minutes down as they power onto the cobbles in pursuit of the breakaway. The speed and commitment of the riders is mind blowing as the group passes up. Thankfully, this time everyone stays upright. Just under 100km including another fifteen cobbled sections lay between the riders and the finish line in the velodrome in Roubaix. Each and every rider who makes it to the finish line has my admiration. Tom Boonen crowned a stellar spring to take the win after soloing away from the field over 50km from the finish. In doing so he equalled Roger De Vlaminck’s record of four Paris Roubaix wins and became the first man to do the Ronde Van Vlaanderen/Paris-Roubaix double twice. I’ll almost certainly be back for more next year! I have never seen, in real life, one of these Classic Races just heard in awe about the feats of these riders. I put tings into context when I consider the speed they travel. Foe me, doing 55kph downhill seems terrifying! These guys use that as normal cruising speed, never mind the cobbles, gradient etc. I moan when i hit an isolated pothole as the shock travels up my arms. These are truly athletes of a different order to us leisure cyclists.